Have you ever been asked this by a Korean friend or acquaintance, but had no idea what “KakaoTalk” is? KakaoTalk, often abbreviated to “KaTalk/카톡,” is a Korean cross-platform messaging application like WhatsApp, Telegram, and Facebook Messenger. It is available in most smartphone platforms including Android, iOS, Blackberry OS and Windows OS. Since its launch in 2010, KakaoTalk has been arguably the most influential smartphone application in Korea. To most Koreans, once they buy a new smartphone, KakaoTalk is almost always the first third-party app downloaded. It has largely replaced texting in Korea, and despite being a third-party application, set a messaging standard. This means that KakaoTalk is sometimes called the “people’s app/국민어플” in Korea. It is used by 93% of smartphone users in Korea. KakaoTalk’s services include instant messaging, including sending multimedia files, voice calls, and video calls like most smartphone instant messaging apps do. Users are able to create a unique profile. Like Facebook, you are able to create a profile for yourself, including a profile picture, status and even a cover picture that others can see. For Korean users, you are even able to add a background music to your profile, if you have the KakaoMusic service as well. This allows yourself to express yourself, something conventional texting could not. Easy sharing of multimedia files. KakaoTalk makes it very easy to share files like pictures, videos, voice messages. Conventional texting, which utilizes the cellular network, is limited in its ability to send pictures, videos, and other multimedia files. However, KakaoTalk, which utilizes internet connection, allows for easy and quick sharing of multimedia files. This allowed users to diversify their communicating experience. Emoticons. Emoticons have allowed users to express themselves in a way that words couldn’t. It largely is a supplementary feature, but it has allowed for a diverse communications experience. User-friendly Approach. KakaoTalk worked hard to establish and maintain a friendly relationship with users since their creation, and tried to “listen to” their user base. Asking for feedback on how to improve the app, and following through with the users’ feedback, KakaoTalk had successfully created an image of a company that actually interacted with the user base. For example, back in 2011, KakaoTalk launched a “100 improvements project” that aimed to receive feedback on 100 top things that users wanted as improvements in KakaoTalk. One of the most asked for service was mVOIP, or voice calling, and KakaoTalk launched VoiceTalk based on this feedback. Kakao Corp. has since expanded its services to numerous other services. KakaoStory, a social networking website which launched in 2012, temporarily created a social networking sensation that topped facebook. KakaoGame, a gaming service like Apple’s Game Center or Google Play Games, allowed users to compete against game high scores of friends in their KakaoTalk, becoming a massive hit and produced iconic games such as Anipang. KakaoTaxi, which was a Uber-like service with taxis, also launched this year. There are more services like KakaoMusic, KakaoPage, KakaoTV and more. Kakao Corp has managed to create a unique ecosystem based on their messaging platform KakaoTalk, and has become one of the largest IT company in Korea. Just last year, Kakao Corp. completed a massive merge with another Korean IT giant Daum. This merging of the two of the largest company has led to the creation of an IT company that aimed to compete against Naver, arguably the number one internet company in Korea. 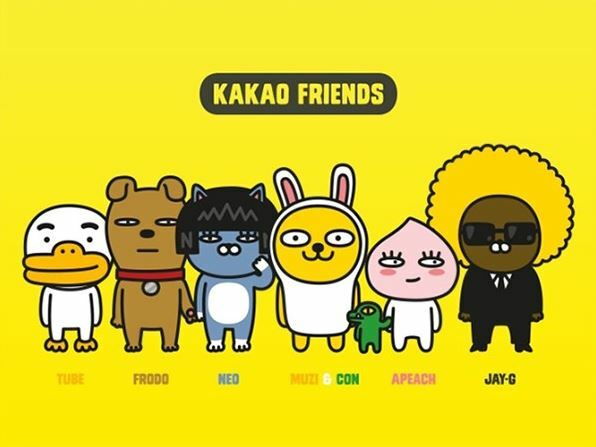 KakaoFriends, Kakao’s own characters that are used as emoticons. They have become iconic to KakaoTalk. KakaoTalk has completely revolutionized communications in Korea, in the sense that it has succeeding in creating a standard instant messaging application, that almost completely replaced SMS texting in Korea, despite being a third-party application. Expanding its services to other sectors, and by merging with one of the largest internet company in Korea, Daum Corp, Kakao has become a huge force in the Korean IT industry. Being one of the more innovative companies, it is interesting to see how they will continue to expand and grow. That’s interesting! Never heard of it being that widely used in Austria, thanks for telling me about it.